Aim. International Comparative Jurisprudence (ICJ) is designed to disseminate original multidisciplinary ideas to the broad audience of scholars and practitioners. The ICJ focuses on theoretical and practical approaches to the wide range of political, legislative, social, economic, and other issues of law. It emphasizes the comparative analysis of international jurisprudence as well as the international aspects of national law of countries across the world. Publishing regularity. Journal publishes 2 issues per year. One issue is published in June and one in December, with a set of minimum 6 and maximum 10 articles per issue. As well, under the decision of the Editorial Board special issues may be published. Indexation. 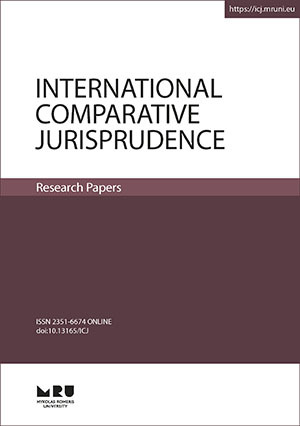 The academic journal International Comparative Jurisprudence is included in the Heinonline, DOAJ, C.E.E.O.L. international databases.